You’ll love these Mediterranean Style Quinoa Patties with Zucchini and Feta Cheese. They are crispy, delicious and easy to make. Cook quinoa the night before or in the morning and finish the patties just before lunch or dinner and you’ll have a complete meatless meal that is full of healthy goodness. 8 years ago, before moving to the US I had no idea what quinoa was. We never cooked with it in Ukraine and even the fanciest groceries didn’t carry it. But after I stepped on American soil and started to explore new interesting food groups, I discovered quinoa and quickly fell in love with it. And when I had read about all its health benefits I loved it even more. 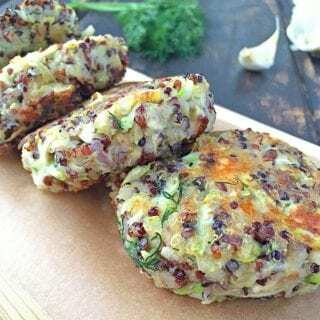 That is my friend when Quinoa Patties With Zucchini happened – a simple, easy and delicious way to put quinoa to a good use. To my big disappointment, my husband is not a huge fan of Quinoa. Since he typically has his lunch at work, he doesn’t eat much of Quinoa-based dishes that I usually cook during the day for me and kids. However, when I first made these Quinoa Fritters, he absolutely loved them. Apart from Quinoa, this recipe consists of a unique combination of ingredients that everyone loves and simply can’t say “no” to. If you’ve never tried Quinoa before, now is the right time to try it. It’s one of those super grains you should be eating as often as possible. And I’m not exaggerating. Just take a look at these 27 Science-Backed Health Benefits Of Quinoa and hurry up to the grocery store to stock up on it. Okay, enough with Quinoa talks! 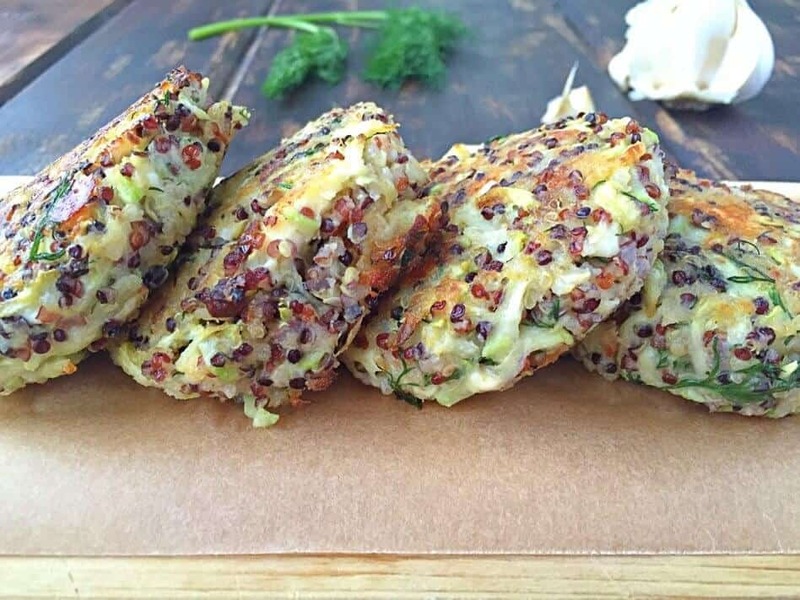 Do you want to know what is one ingredient that makes these Quinoa Patties extra special? Cheese makes everything batter, isn’t it? I’m pretty sure this was a saying about Cheddar cheese, which ironically we’r not using in this recipe. However, to give my recipe Mediterranean twist I added some Feta cheese which I’m a huge fan of. I love incorporating Feta in a variety of my dishes, like in these super yummy Cauliflower Cakes with Dill Pickle Sauce or Roasted Brussel Sprouts Recipe With Balsamic Vinaigrette. By adding Feta to this recipe, you’re making patties extra delicate and even more delicious. What else can you add to the Quinoa Patties? If you don’t like Feta, you can definitely substitute with other cheeses. Goat Cheese, Parmesan or Gruyere would work great as well. Or you can even take a mix of different cheeses. If you are like me who loves cheese, you know, you can’t spoil the dish with some extra cheese, right? Okay, we’ve got quinoa, we’ve got cheese. Now, let’s add some more healthy goodness to the recipe. And here comes my favorite Zucchini. By adding this delicious vegetable, you’re enhancing these quinoa patties with vitamins, making them a great healthy meal for the whole family. When working with Zucchini, there’s one important thing to keep in mind. When you shred Zucchini, make sure to drain as much liquid out of them as possible. Otherwise, it won’t be as easy to form the patties and you’ll have to add more breadcrumbs. And don’t forget to make the Greek Yogurt Sauce. It’ll just take you a few extra minutes but it pairs beautifully with Quinoa Cakes. 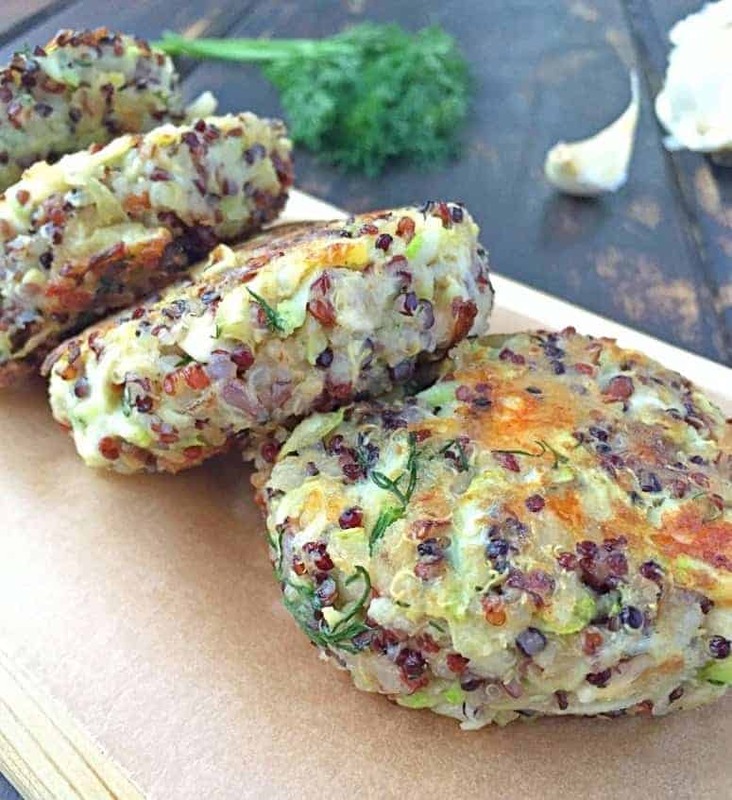 How To Make Vegetarian Quinoa Zucchini Patties? If you want to make these Quinoa Patties without eggs, just add a few extra tablespoons of breadcrumbs until the mixture starts to hold together when shaped into a pattie. You can also easily substitute Feta by either using vegan cheese or adding one of the ingredients from my suggestions above. If you make these Zucchini Quinoa Patties, don’t forget to snap a picture and post it on Instagram with a hashtag #lavenderandmacarons. Healthy and delicious, Mediterranean Style Quinoa Cakes for when your body craves healthy. Part of the recipe can be prepared ahead of time. In a medium saucepan combine quinoa with 1.5 cups water. Bring to a boil. Cover, reduce heat to low, and simmer until quinoa is tender, about 15 minutes. Let it cool. In a big bowl, combine cooked quinoa, zucchini, Feta cheese, garlic, dill, sun-dried tomatoes, eggs, bread crumbs, salt and pepper. Mix well. Form the mixture into small patties. If they start to fall apart, add more breadcrumbs, one tablespoon at a time. Heat 2 tablespoons of oil in a large non-stick skillet over medium-low heat. Working in batches, cook the patties for 5 minutes. Slowly and carefully flip the patties and cook for another 5 minutes. Transfer to a plate and let them cool while you prepare the sauce. In a small bowl stir together Greek Yogurt, baby dill pickle, dill and garlic. Season with salt and pepper to your taste and give everything another stir. In my recipe I used Rainbow Quinoa, but you can use any type of Quinoa you have. Cooked Quinoa will keep for 1 week in a fridge and up to 8-12 months in the freezer. You should try to drain as much liquid as possible out of zucchini. Several changes of paper towels might be needed. These look like a tasty and healthy alternative to a hamburger patty. I would love to add in the sun dried tomatoes for some extra flavor. YUM! Yes, sun-dried tomatoes would definitely be a great addition to these patties. I really like this way to use quinoa. Love all the flavors in the recipe. I’ll have to try these! These were so good! Love the zucchini and feta with quinoa, my daughter LOVED them! I’m so happy you liked the recipe Tracy! Everything is better with feta so these look great. They would make nice burgers. Thanks for your comment Andrea! I’m so glad you and your husband liked the recipe! Hi, I made these patties this week. I add extra feta because we love cheese. After I fried the first patties I decided to cook them in the oven. My girls love the second patties. Thank you for this receipe, it’s yummy! Hi Mariana! Thank you for your comment. I’m so glad you and your daughters loved the recipe:) I should try to cook those patties in the oven too. I was short on time so I doubled recipe and threw it all in a 9 by 13 pan as a casserole. Turned out great! Thank you for recipe!! I’m glad you liked the recipe! Casserole sounds great! I should try this as well! Do you knowknow what the nutritional facts are per serving? How many patties make one serving? About 3 or 4 patties. Just so that you know, flax egg works wonderfully. Although my ratio is 1 part ground flax seed to 2.5 parts water, no heating necessary. Thanks for letting me know Joey! I’m gonna try flax egg next time as well. My mom and I made these for dinner and OH MY GOODNESS! They were totally amazing and stuck together very well with some extra breadcrumbs. Thank you so much for this amazing recipe! Love these! Even my 16 year old son who hates zucchini liked them! I’m so glad to hear this Sara! This looks amazing! Any chance I could bake these in the oven instead of frying them? What temperature and for how long would you bake them? Thank you!!!! Thank you Kaizoot! You can definitely bake them. I would do this at 400 F for 10 minutes on each side until the patties are nice and brown on both sides. These are the freakin’ bomb! Mine turned out kind of crumbly and didn’t stay in patty form. Any idea? Also, do you know if these freeze well? I love to have a stock of healthy patties in my freezer for quick lunches and dinners. Thanks! Can’t wait to make these again! Yes, it’s a little tricky to form patties. Every time I make this recipe, I have to work really slow and very careful with the quinoa mixture to form the patties. When I form patties, I make sure they look as smooth as possible (without cracks) before I slowly transfer them to a pan. Make sure you squeeze as much liquid as possible out of zucchinis. You can use cheesecloth for that. I usually use bounty paper. You can also try to add more flour, 1-2 tablespoons I would say. Yes, you can freeze these. And when you’re ready to cook them, don’t defrost, just throw on a skillet and cook on a lower heat under the lid, slightly longer than usual. I don’t care for feta cheese, what would be a good substitute? ( I wouldn’t want it to melt all over the pan}. Sorry, just saw your comment. You can use parmesan or gruyere cheese. Any other hard cheese would do. I love quinoa patties and make them with brown rice. This recipe looks yummy but I was wondering if I can replace the eggs. Any recommendations? So sorry, haven’t seen your comment before. I’ve never substituted egg in cooking, so I googled and here’s what I found. “Flax egg” – Mix 1 Tablespoon ground flax seed with 3 Tablespoons hot water. Set aside for a few minutes until the mixture thickens. It should be as thick and sticky as an egg white. (If it isn’t thickening, you can heat it until it does so, and then cool and add to your recipe.) You can make a larger batch and store in the refrigerator in a covered container up to 2 weeks. Just keep the 1:3 ratio. Measure out 3 1/2 Tablespoons “flax egg” for each egg needed. Note that a flax egg only replaces the binding property of an egg, so if you are using it in baking recipes that need to rise, add 1/4 teaspoon extra baking powder to provide the leavening needed. Chia seed – Use the same as flax seed. You can try those options. I used to substitute eggs in baking by using an apple sauce, but for this particular recipe, the above suggestions may be a better alternative. Thank you, Iryna. The flax seed/chia seed idea sounds interesting. I will try that and will keep you posted. So looking forward to trying it. Yes, that might be the reason. Zucchinis tend to be really watery. Or you could add a little more breadcrumbs for a slighter dense consistency. How yummy!! Thank you for sharing this delicious and mouthwatering healthy recipe over at Healthy Living Link Party! Hope you stop by again! Pinned too.. I am featuring your post on our next party, don’t forget to grab your featured button. These look delicious, but where is the zucchini? Oh, I forgot to include a zucchini. Thank you for letting me know, I’ve already corrected the recipe. Yum! I’m putting this on my post-Christmas-healthy-eating-resolution recipe list. Thank you! Oh yum , these look super delicious! Very mouth watering – I totally pinned them to my food love board! Thank you for this amazing recipe! Thanks for your comment Chrissy! These patties are delicious indeed. Subscribe to my newsletters for your weekly happy mail!